Everybody Breaks Things – He Said What?! Have I told you that Aaron doesn’t like for his world to be upset? Yeah, I knew I had. And I’ve also told you that when Aaron’s world is upset, Gary and I usually end up in the turmoil as well. We were reminded of that fact last night, once again. Yesterday was a fun day for Aaron. He and I went to see Night at the Museum while Gary took care of some work around the house. Aaron and I shared popcorn, which of course we couldn’t start eating until the movie had actually started. “Now, Aaron?” I asked as we sat down. “Now?” I asked again as the screen was showing all sorts of things to keep us entertained before the movie started. “Now?” I asked when the trailers began. So when the movie started, he said, “Now!” And I reached down for our bucket of popcorn, feeling like I was beginning a race. Which it kind of was as Aaron ate fast and furiously, determined not to let me cheat him out of his fair share of popcorn with extra butter. I had already confiscated most of his HUGE stash of napkins he managed to grab while I wasn’t looking, but he was NOT going to let me do the same with his popcorn! After the movie, we ate a very unhealthy supper at Burger King…..but Aaron loved every bite, and I tried to eat mine without too much guilt. We came home and watched Wheel of Fortune. It was a nice day, full of Aaron’s favorites. He went to bed happy, and ready to read a little in his Handy Answer Gardening Book. He could care less about gardening and plants but it’s the next book in his order of books and so he MUST read it…..and he is…..Every. Single. Word. We said our goodnights and Aaron finally settled in to read, after following me a couple times to my room. Finally I was alone and able to start my bedtime routine. Gary was still downstairs. After some time, my door burst open and in stormed Aaron. I was beginning my routine lecture about knocking before he enters when I looked up and saw his face. I could tell that whatever the something was, I had better go see it now. It didn’t matter about being tired and wanting to go to bed. Aaron was desperate, and I could not imagine what was wrong. He hurried up the hall to his room, with me following….full of dread. We walked in his room and there it was. Aaron had done something to his desk drawer. His explanation wasn’t quite clear, but whatever he had done, the large center drawer to his new desk had broken. All the items that were in the drawer were on the floor, as well as the drawer bottom and the front of the drawer with the handle. He was very, very upset…..a combination of wondering if he was in trouble to just being sick that his new desk was now broken. He kept saying he was sorry, and saying he was scared, and trying to decide what to do, and if the desk could be fixed….and I’m sorry, I’m sorry, I’m sorry. I felt very sorry for HIM, after the shock of what had happened quickly passed. Gary came upstairs then, and we both assured Aaron that it was fine and that we would look at it tomorrow. Finally we were all in bed. We hoped that Aaron would sleep. He was so upset and agitated by what had happened. Gary and I lay there, trying to go to sleep, when through the baby monitor we heard Aaron softly say, “I’m scared.” I wanted to run in his room and assure him that it was OK, but I knew I needed to stay put and try to let him calm down. After a few minutes, he spoke softly again. “I should listen,” he said. Oh dear! I felt so bad. How many times have I told him that he should listen when we tell him something? Now he was saying those words as he lay there all alone, his mangled desk drawer a reminder of how he doesn’t listen. Gary could read me even in the dark. He told me that Aaron was all right. I wanted to believe that. Later, before Aaron went to sleep, he said something about a nightmare. And I just prayed that Aaron would soon go to sleep, which he did, and finally Gary and I did, too. I heard Aaron stirring early this morning. Once again, he spoke, saying something again about a nightmare. When I got up soon after, I saw Aaron’s light on and so I went in his room. He was sitting there at his computer, headphones on, with his feet trying to rest on the floor without touching any of the mess that was there from the broken drawer. I patted his shoulder, and smiled at him as he looked at me. He and I then picked up the items on the floor and put them in a plastic crate that was in his closet. I placed the crate on his bed, and went on downstairs. Soon Aaron followed, and in his arms he had the crate full of his stuff. He set it on the kitchen table. And I noticed how awful he looked. His eyes were so tired. He looked as if he had hardly slept. All of this stress over a broken desk drawer! As the morning wore on, he seemed a little better. He clipped the few coupons that were in the paper, drank his coffee, and showered. 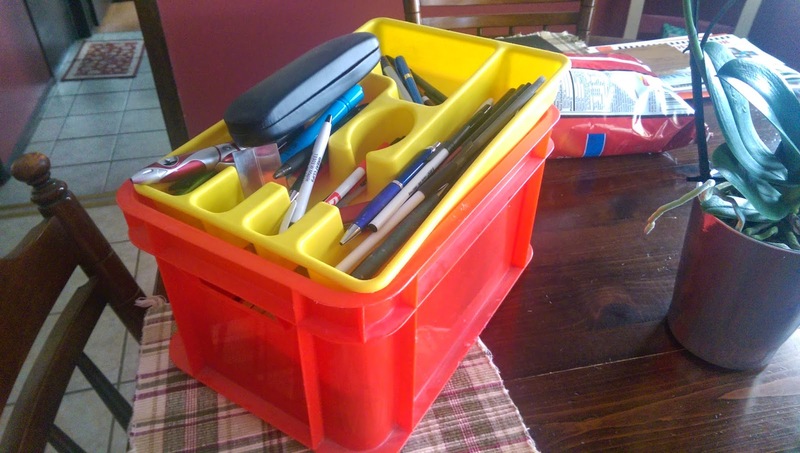 I carried his box of desk items back up to his room. After his shower, he came back downstairs. 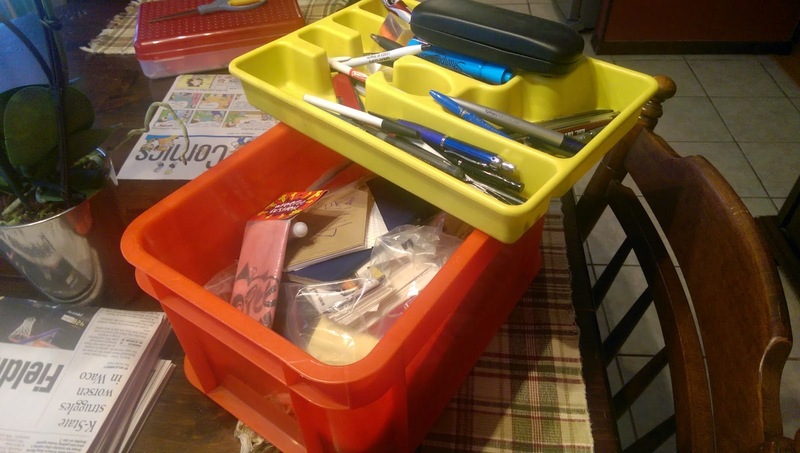 In his arms was the crate full of his desk stuff again, which he put back on the kitchen table. “You don’t want that in your room, do you?” I asked him. He solemnly said no, so I left the crate there, knowing it wasn’t worth upsetting him further. Gary told him that he thought he could fix the desk drawer, and I could see Aaron relax some. Then I remembered something! “Aaron, come look at something,” I told him. He followed me into the guest room, where I showed him something that was laying on the bed. It was the very nice frame from the beautiful framed piece that Megan, Andrew’s girlfriend, had given us for Christmas. The frame I had broken one day, by accident…..but broken none the less. I felt so horrible the day I broke that frame, but now I was almost thankful for it because I could use it to show Aaron that he wasn’t alone in how he felt. He wasn’t alone in HIS brokenness. So that’s what I told him. I told him how I broke the frame and of how awful I felt about it. “So everybody breaks things,” he quietly stated. And with that, Aaron was ok. He went back to bed and slept for a couple hours, waking up fresh and happy once again, and with no talk of broken desk drawers or mess on the floor. He knows that Dad will try to fix the drawer…..and if anyone can fix the drawer, Dad can! And he knows that Mom recently broke something very special, and though Mom felt terrible about it, she was all right…..and he would be all right, too. But most of all, Aaron knew that he was not alone and that he was forgiven. And in that companionship and forgiveness, the world was right once more. Not just for Aaron, either. It worked both ways, for Gary and me as well. We share Aaron’s turmoil, yes, but we share the joy, too. Have I told you it works that way? I’m sure I have. Previous Previous post: Wanting Aaron to Do Things….Or NOT! Next Next post: Unlock the Door!